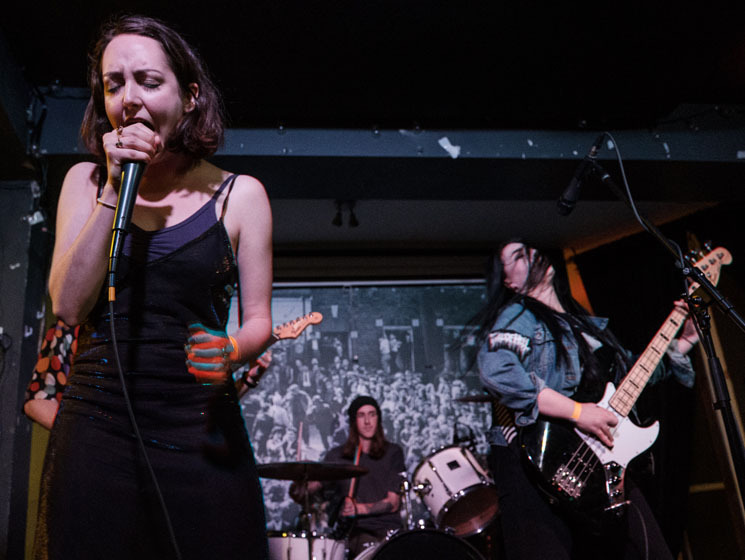 Coming in fast and hard, puckish punk unit WLMRT used Wavelength's all-ages matinee to deliver a tight, brief set that bottled the acerbic soft culture waxing of their pair of EPs. While singer Shelby (forget about surnames) voiced the existential dread of the reluctant but culturally embedded consumer through breathless, dizzying diatribes, Adam sent listeners spiralling down razor-sharp guitar vortexes, and Ryan contributed wonky synth textures that added further disorientation to the mix, a rhythm section assaulting equilibriums from all directions. Clocking in around 15 minutes, it culminated in a blistering run through fresh EP Plan B's "Roadway," punctuated by a hammy moment of tonally committed, lo-fi gimmickry, a bubble machine burping up a single, sparse cloud of soapy spheres. Watch WLMRT's Wild and Fun Video for "CUTV"